On some small test video clip (about 5 minutes) I experimented using the “size and position” filter for almost 2 hours until I was satisfied with the results. Now I want to apply it onto another video. Is it possible to ‘copy something’ so not to go all over it again on the real video. Is it possible to ‘copy something’ so not to go all over it again on the real video. Save the Size and Position filter that you like as a preset. Then you can apply it to any video. Here, please, have another question in the same area. When I reduce part of the video with this “Size & Position” filter, the remaining of the window is black. How can I use some whatever background just to hide this black color. I modified the size and position of a video (track V2). To cover the black background, I have only previously added a track (V1). On track V1 as an example, I included an image as a background. 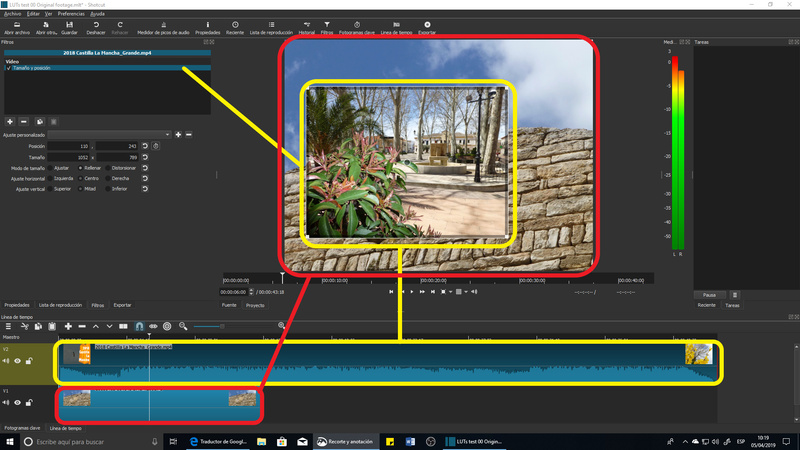 Excuse me please for asking, what program have you used to make the yellow and red drawings on top of the shotcut screenshot. To make the screenshot I use the app integrated into W10 Crop and annotation, before saving the screenshot I link to Paint 3D (also integrated into W10) and I add the rectangles and other forms to facilitate the understanding of what I want to explain. My OS is win 10 pro 64 bit 1709. I searched for the ‘Paint 3D’ in the system but did not find it. Several hours earlier made a Google search for some program and this is what I found here “http://www.iphotodraw.com/”, iPhotoDraw (Portable version). Its free, does not have to be installed, just unzipped into a folder. I am just practicing it, till now I found it takes screenshots, can draw those figures I asked you about and on the help site are some tutorial video clips. Here you can access the Paint 3D app. Download this app from Microsoft Store for Windows 10, Windows 10 Team (Surface Hub). See screenshots, read the latest customer reviews, and compare ratings for Paint 3D. If it is available in your geographical area and your computer meets the requirements, there should be no problems. Although the video shows the use with a graphic tablet, I use it with the mouse, although I have a pen tablet I do not use it with this software. Regarding iPhotoDraw is an interesting option, if Paint 3D was not free.